When Rod Walker decides to take the final test for "Deacon" Matson's interplanetary survival course, he knows he will be facing life-or-death situations on an unsettled planet. What he doesn't expect is that something will go wrong with the "Tunnel in the Sky" and he and his fellow students will not be able to return to Terra. Stranded on a hostile planet, Rod and his friends are faced with the challenge of carving a civilization out of the wilderness. They must deal with hunger, deprivation, and strangely savage beasts. But the bigger question is, can they survive each other? This science fiction classic pits a savage world against the most untameable beast of all: the human animal. 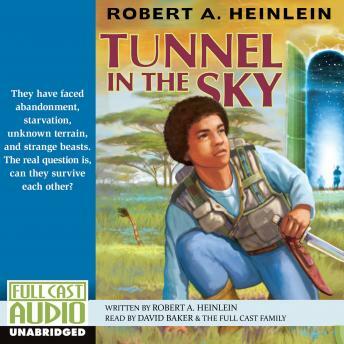 Chock full of high adventure, futuristic speculation, witty repartee, and profound philosophy, Tunnel in the Sky represents the greatest SF writer of all time at his peak.